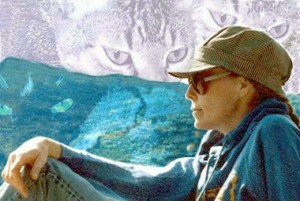 There are cat lovers and then there is Wendy Christensen. She does it all. With Wendy Christensen, it’s All Cats, All the Time. Wendy is The Cat Herder™ at Bobcat Mountain Studios, perched high on a hillside in rural New Hampshire. 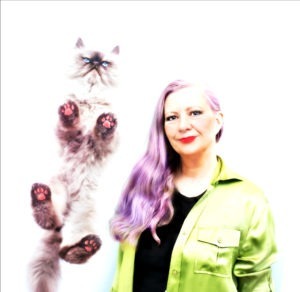 She’s a Cultural ailurologist; award-winning writer, artist and illustrator; painter of cat portraits; designer and builder of cat jewelry; cat behavior consultant, and pet columnist. She’s the author of the award-winning Outwitting Cats and other books.Wendy shares her home with 10,000 books, a scientist husband and ten cats. I first became acquainted with Wendy in her position as Secretary for the Cat Writers Association. She embodies the best of what a cat lover is, and I’m delighted to share this Q & A with you. Wendy finds her bliss in creatively representing, in multiple media, the wonder, mystery and joy of cats in and of themselves, and in their relationships with humans. Her writing focuses on the social life, culture and behavior of cats living in groups with humans. 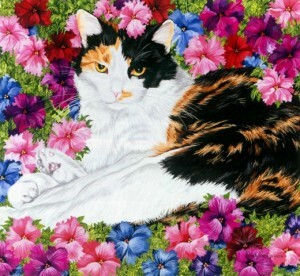 Her painting focuses on capturing the uniqueness, beauty and “catness” of each individual kitty she portrays. Her devotion to cats is clear with every brushstroke. Wendy generously donated one of her stunning one-of-a-kind cat necklaces, as this week’s giveaway. Today is the last chance to enter. If you haven’t already done so, leave a comment, saying you’d like to win. The winner will be announced tomorrow. LMW: Which is your favorite form of creative expression? WAC: That’s hard to say. I have an engineer’s temperament and I like to build things. I use different tools (keyboard, pliers, brushes, trowel, grammar), and materials (words, beads, color, plants) for the different things I do, but it’s all the same design/composition/assembly process. I’m a detail-conscious, careful craftsman in all things. There’s a lot of synergy among all my activities, including non cat-specific activities such as gardening and hiking. They all feed one another. I may write an article in my head while hiking, get an idea for a new necklace while tending my hundreds of lilies, or mentally sort out color options for a painting while doing paperwork for the CWA. LMW: When did you first realize cats were a creative muse for you? WAC: I’ve been drawing and painting cats as long as I can remember. Cats have always been such a big part of my life that it was just natural. I was very lucky to live with a lot of cats (over 40 at one time) as a kid. Each one was a friend of mine and fondly remembered. As a teenager, I used to cook and serve dinner for the family, then go out in the front yard with my supper and my sketchbook to watch and draw the cats. LMW: Who was your first feline love? WAC: Picture a cardboard box outside a supermarket. A kid with a sign: “Free Kittens.” In the box: five gorgeous, blue-eyed white kittens. But wait – one of them has one green eye! And not just the usual cat-green: a clear, pure grass green, to go with the clear, pure sky blue. I was instantly in love. Fortunately, my mother was, too. I lobbied hard for all five, but we took only little Freaky home. She fluffed out as she grew, blossoming into a sweet-tempered, stunningly lovely cat with a glorious plume tail. She enjoyed a long, healthy life and was my mom’s closest companion during Mom’s last few years of life. LMW: Tell us a little about your current cat family. WAC: I live with ten remarkable felines, all former shelter babies. I always adopt in pairs or trios. My eldest at 11 years old are a trio: The Wizard of Bobcat Mountain (“Wiz”) and Sir Sterling Silver Longfellow (“Silver”) and their sister, Abigail Tabitha (“Puma.”) My gorgeous, longhaired calico sisters, Angel and Chrysanthemum, are ten. Sisters Winnipesaukee (“Winnie”), Pemigewasset (“Pemi”) and Aunt Jesse Guernsey (“Jessie”) are seven. Brother-and-sister team Prince Syvert the Bold (“Syvert’) and Hazel-Marie (“Pit Viper”) are my youngest at almost five. All but the calicos are former ferals. They are a great group, get along extremely well, and manage their feline social lives masterfully. Some of them have self-appointed jobs. I spend an awful lot of time just observing and studying them. They’re my best friends and constant inspiration. Great napping buddies, too. LMW: Any plans on enlarging it or fostering cats or kittens? WAC: Not at the moment… I don’t think I could ever give up cats or kittens I’d fostered. So I don’t foster. I could handle two or three more cats, but my husband is slightly allergic and has set our limit at ten. I think I could handle at least two or three more, but not as many as 20. LMW: Do you volunteer at a shelter or for any cat-related cause? WAC: I’ve done a lot of volunteer work for a local shelter called Monadnock Kitty Rescue and Adoption, home of my five youngest kitties. I’ve done paperwork, financial stuff, fundraising activities, newsletters, shelter cleanup, ringworm testing and just sitting around and entertaining the kitties. I also consider my twice-monthly regional newspaper pet column a form of outreach for cat-related causes. I stress the basic of responsible pet ownership – regular veterinary care, proper diet, vaccinations, spay/neuter, the downsides of declawing, environmental enrichment — and plug our local shelters as often as I can. LMW: Cat hoarding is a growing issue in this country. How many cats do you feel is too many? WAC: It’s an ecological decision in the sense that your household is an ecology. It depends on the composition and lifestyle of the household and the available resources such as money, space, time and attention that can be dedicated, long-term, to supporting cats. In my latest book, Outwitting Cats, I discuss a concept called “cat carrying capacity: “ “Every household has a natural ‘cat carrying capacity’ beyond which it’s unwise and unhealthy, for people and cats alike, to go. No matter how much you love cats, don’t make the mistake of adopting more cats than your household resources (which include space, time, and attention) can support. Doing so may place you, one day, in the heartbreaking position of having to reduce the number of cats in your household in order to preserve an acceptable quality of life for the others, and to save your own health and sanity. In households with too many cats, spraying, marking, and other difficult-to-live-with misbehaviors usually worsen until the number of cats is reduced.” For some households, the cat carrying capacity is one. For others, it may be dozens. LMW: Do you think the definition of “cat lover” is changing in terms of age or gender? The old stereotype of “crazy cat lady” is gradually (very gradually) breaking down as cats are embraced by more people of all ages, genders and lifestyles. As America’s most numerous domestic companion animal (at over 90 million owned cats and counting), cats are winning over one person at a time, as they’ve always done since the early days of the feline-human relationship in ancient Egypt. LMW: Do you consider yourself a crazy cat lady, and is the definition of that term changing? WAC:The term “crazy cat lady” has too many pejorative connotations to be useful or illuminating. It’s time to stop using it, even in jest. LMW: There is much heated discussion about what to feed cats, with advocates for feeding raw, grain-free, wet, dry and everything in between. Even vets can’t seem to agree. What do you feed your cats and why? WAC: Cats need a diet rich in protein and fat and very, very low in carbohydrates. My cats get a variety of chicken, turkey and salmon flavors of Fancy Feast. My husband is a scientist and has run the numbers on the protein and other content of various brands of cat food. He’s found Fancy Feast superior, according to the latest data on optimum feline nutrition. We don’t feed any tuna because it worsens Silver’s food sensitivities. For treats, we feed a limited amount of Hills TD, a complete dental diet. The cats have to work at crunching on the extra large nuggets, and TD has a scraping action that really keeps their teeth clean. Only a few of my cats have ever needed veterinary dental cleanings. They all have beautiful teeth – in spite of my poor ability to get a toothbrush in any of their mouths. And they adore the TD. We toss or roll the nuggets one at a time, so the kitties have to chase or leap for them – clean teeth, great exercise and lots of fun, too. LMW: Any must-have cat toys your cats can’t live without? WAC: All the cats like interactive play best. Da Bird! and the Kitty Tease are in heavy daily rotation around here. Wiz also adores colorful, oversized plastic coated springs, of all things. Syvert has an ancient sparkle-ball that he carries everywhere, then loses under the furniture or a closet door. (It’s currently lost, but I’m sure it’ll reappear at some point.) The Pawbreaker is a favorite for the awesome rumbly-grumbly sound it makes rolling across the floor, and all the kitties like anything with feathers. LMW: Cat culture is growing, as is cat blogging and cat-related products. Where do you see this trend headed? WAC: More cats, of course. More cat books, blogs, products and everything else: Cats are taking over the world. The Internet, and the old usenet before it, were originally made just for disseminating cat material, I believe. net.pets was the first cat blog. LMW: Many see cats as spiritual teachers. What have your cats taught you? WAC: I am not a particularly forceful or assertive person, but when it comes to cats, cat welfare and educating people about cats, I can be very persistent indeed. Just by being their marvelous selves, cats have given me the inspiration and courage to be brave and relentless in defending them, protecting them and speaking out for them. I try not to be preachy or a pest but I am very determined! I can, when I have to, confront people who I think are not doing right by their animals. I take every opportunity to speak up about and for cats: to remind people how much cats need and deserve their claws, to point out the importance of spaying and neutering, to talk up TNR, to encourage shelter adoptions, to suggest environmental enrichment strategies, and to help people out with their cat behavior challenges, whether in person or via email. Oh, and the joys of napping in the sunshine. Nothing like a ten-cat-catnap to inspire creative thinking and to spark plans for new projects. LMW: There is an explosion of new books about cats on the market. What advice would you give for a first time cat owner to read or do before adopting? WAC: Read my latest book, Outwitting Cats. I spend a lot of time explaining how cats thing, what they need and want, and how to get off on the right paw and prevent behavior and other problems before they occur. Plus, I offer tons of tips and strategies for cat-friendly home design and décor, dealing with unwanted behavior and living with cats in general. Editor’s note: Layla is currently reading and loving Outwitting Cats and will review it at the Cat Wisdom 101 Sunday book reviews. Heya, what do you think on the subject of canon printer updates? Pretty neat idea, isn’t it? Wendy is the best, and incredibly talented! Great interview! Such a great interview and such a wonderful human, she is truly an inspiration! Wendy’s paintings are so over-the-top fabulous, and her jewelry is kewl, whether you’re a cat lover or not. Thanks for sharing her insights on all things cat. She certainly is good at everything she does and I bet her book is excellent. She sounds like she has the cat world by the tail. Great post. Great interview! Wendy has blessed Catnip Chronicles with a fine story for our readers – coming soon – sorta. Neat, eh? Wonderful interview – how nice to learn a little more about Wendy. I especially love her answer to the crazy cat lady question. I think that as cat writers and bloggers, we have an opportunity, and maybe even an obligation, to stop using that term. Even using it in a joking manner perpetuates the stereotype. Very Talented ! 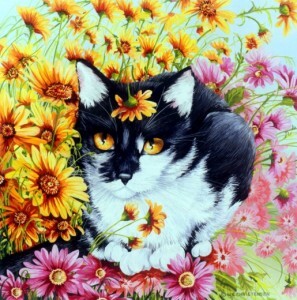 Great work of painting, Very bright and colorful and she captured the cat…Fabulous ! Wendy’s work is just beautiful! Thank you for this wonderful interview, she had up to 40 cats at one time? OMG I can’t imagine! I would love to be entered for the necklace! I would be honored!